We live in a very results-oriented world. Everyone wants results, usually with minimal effort. People want to lose weight, make money online, and find their passion. And they want these results quickly. If you’re just starting your business and want to help others, I’m sure you want to share your results as well. You probably want to tell them how your product can 10X their business. Or how your coaching services can help them lose weight or find the relationship of their dreams. It’s only natural, you’re an entrepreneur. You want to show your skills, inspire, teach, and positively impact others. But at the beginning of your journey, it’s easy to feel like your results aren’t big enough to really matter. I’m here to tell you that the exact opposite is true. Your future clients actually want to see the entire process of your success. Sure, people like to read about one-off stories about entrepreneurs making $100,000 a month. But most of your audience wants to see smaller results first. Because showing massive results to your audience isn’t always relatable. They might feel like the gap from where they are to where you are is just too big to overcome. When you’re selling a product or building a tribe, you have to be relatable. If people can’t relate to you or one of your successful clients, good luck. People need to find something to relate to you about. A good example is my webinar company, Easy Webinar. We have some clients doing $20,000 in sales per day while others are only doing a few hundred dollars. It’s easy to think the $20,000 is much more motivating to potential clients. But in reality, a majority of my audience just wants to sell an extra $300-$500 per day. Imagine if you want to make $500 or $1,000 and you see someone making 20X your results. it’s really hard to relate to them. For some, this is motivating as they know what’s possible. For others, it can actually be demotivating and turn them away from your offerings. If you’re doing this in your business, I recommend switching it up. Instead of just focusing on the big results, focus on the next level. You have to give your audience results that they are confident they can achieve and make them want to take action. Remember, you can’t get to $100,000 a month without first making $1,000, then $10,000 and then $25,000. People won’t always take your word for the results of your product or service either. That’s why testimonials, both written and video, are super helpful to sell your product or service. 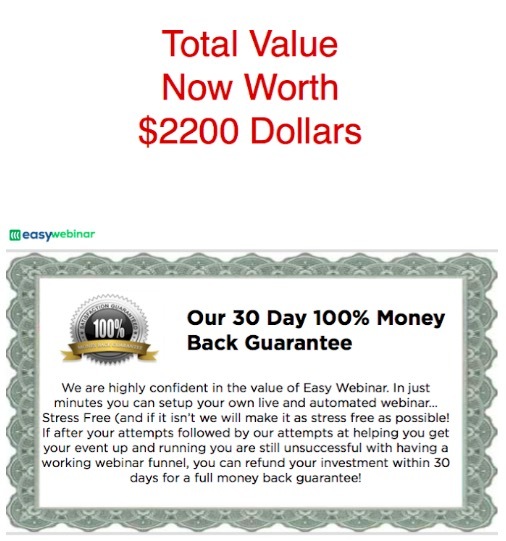 With Easy Webinar we share all kinds of results, not just the clients killing it with $20,000 in daily sales. Some of the most successful coaches and influencers constantly show off different types of results. I do the same by sharing screenshots of people succeeding at all different levels. This will help broaden your market and attract the right type of clients. It’s important to show case studies and testimonials for clients at different levels of success. Don’t just show one massive result and expect to bring in a ton of clients. You want to be able to show your future tribe members how you can help them along the journey. Has this post been helpful? Do you want to take these ideas to the next level? Grab your FREE fillable worksheet by clicking the button below! 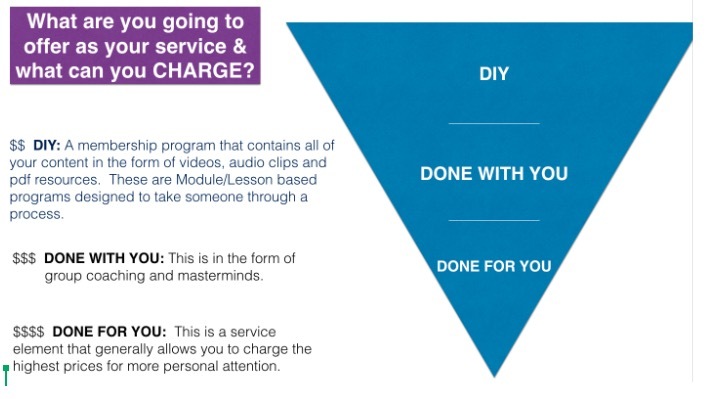 If you’re just starting out, you might only have one or two products or tiers of service. But as you grow it’s important that you offer different options for your clients to grow with you as well. This is known as a value ladder. A value ladder is an amazing way to offer different products or services to existing clients. One example is what I do with Easy Webinar as we have three different options. The first one is a more beginner type of service for people just getting started with webinars. Then a middle option and an enterprise level. Each one is more expensive but also comes with more features and additional, more personalized support. It’s easy to do the same for your business as well. If you’re a coach, you can have an intro course, intermediate, and maybe a high-level mastermind. The first option might be 100% automated, while the high-level mastermind is more intensive and expensive. Remember, not everyone starts at the same place. Each person needs different levels of support to reach their goals. If you’re doing it right you can get someone in on the first tier product and progress them throughout your value ladder. Once they see results, they are much more likely to continue buying from you as well. They have already seen the results and have built a relationship with you. This is why it’s crucial to have several products or services. Even with the best sales page and enticing call-to-action, people want to see results. You want to make it clear to people just learning about you that your clients results are the number one priority. People want results more than anything else. They want to speed up success by purchasing your product or service. Be proud of the results that you can deliver. Don’t feel like you have to be making six-figures a month before you share with the world. As Peter Drucker said, “Effective leadership is not about making speeches or being like; leadership is defined by results, not attributes.” Focus on the results, no matter what size, and lead your clients to the result they crave. Don’t forget to grab your FREE fillable worksheet about building trust with clients and getting them results. Just click the button below! I have been compelled to write this particular post due to the overwhelming request for an answer to this question I get. As founder of EasyWebinar, and as someone who has created countless webinars with offers for different courses, software, and coaching, I have not only seen what offers work and what offers fall short. From both my own experiences of selling on webinars, sales pages and on the phone for high ticket coaching over 7500. The biggest thing I can tell you when determining what you are offering is to ask this question. What does your offer (Program, coaching, service) solve? What does it promise to alleviate? Most people when struggling to figure out what to charge or how to craft their offer from a video or a webinar struggles with that biggest fundamental question. Or they will downplay what their solution solves. They will focus on say the feature set of their solution and not the big picture. They often times don’t RAISE THE STAKES enough in their own offer. For instance, I have a coaching client who is a personal fitness expert. He has a program that teaches fitness and meal plans that are intended to help someone get back in shape and stay consistent with a new lifestyle. He was struggling to figure out what to charge for the program. The key points I ask are these. 1. What is the maximum benefit of the benefit of your program? When I asked him, this is what he said. Yes, that is the benefit, but what is the benefit of the benefit? If they get health, eat right, stay fit, build endurance, what can/does that do for their lives? When I asked to reframe to that, he started to tell me a story of one of his clients who went from being obese and depressed to losing the weight which was a bridge to finding the love of his life, transitioning into a different career that made him happy, and finding more time to do all the things he couldn’t do before when he was obese. this person was on the verge of suicide. As he unfolded this story, the benefit of the benefit emerged. The result of his program is nothing less than LIFE CHANGING. The vehicle for this massive change is through fitness, and meal plans. 2. The second thing I ask (which he started to answer on his own) is, what feedback are you getting from clients? Are they telling you the RESULTS they are seeing from your program? You see, even if you find it a challenge mentally, your clientele’s feedback can help with that. I have another client who sells a program on getting rid of acne. When I asked her what her audience says about her program, she actually revealed that her clients call it LIFE CHANGING. What will someone pay for LIFE CHANGING? If you are someone pivoting to working for yourself, this next section is for you. No Clients and In Transition? “Casey, what if I don’t have any results from clients? Well, my response is…”Did you get results for others while at your previous job? Or have you helped someone with your expertise that you didn’t charge? All of these scenarios can be used to measure results as long as there was transformation. But don’t make this common mistake when pivoting to work for yourself. For instance, if you were earning 60k working for someone else as let’s say a photographer, the natural instinct based on what you’ve been use to is to charge prices on an hourly basis in a similar fashion. The problem with working by the hour is that the 40 hour work week construct as a w2 employee is NOT the same when you begin to work for yourself. As an small business when starting out you are doing most of the work yourself. And as such there might be weeks where you are working 60 hours or more. Or sometimes 20 hours depending on the workload. So taking that 60k and dividing it into hourly won’t make sense for your transition. Nowadays, if I were to breakdown a result I can get with someone in an hourly basis, my hourly value is 2k per hour. However, I rarely do hourly coaching. I might do a day’s worth of coaching to a client, where I dive into their business which can often lead to a 6 figure result for them. But as such even if I were to break down my hourly, I still focus on what results can be achieved from working with me. Adjust your mindset when making the transition to working for yourself. If you are say a photographer, base your pricing on a per project basis. Let’s say you are a headshot photographer. As such if you can highlight that it isn’t that you will shoot someone for 3 hours and deliver x number of photos to them, it is about how you can help them to get the auditions they want through a compelling picture that few others can do. As such, people who hire you will pay you per project based on your best results. (The result being that your clients get booked in acting projects) So that would be more like a 2k package where it is less based on hourly. 5. STOP UNDERCUTTING YOUR COMPETITION. The common track for most startups is to undercut the market (their competition) by offering lower prices. But inherently by doing so, you start attracting the wrong clients. You start attracting clients solely based on price. don’t value your time and often take very little action. you get them results or pay bargain basement pricing? If you can solve their BIGGEST PROBLEM, that is what they care about. You see, CHARGING HIGHER PRICES HELPS TO FIND THE RIGHT CLIENT. It helps you to qualify the right clientele. AGAIN…Big Results = Allows You To Charge Higher Prices. Is exactly why our coaching programs aren’t cheap, nor is our software products. When people join our programs they are paying an investment in themselves to potentially get to the same point as our other clients. We provide transformation and clarity. So think about what transformation can you provide your clients? When you start to become a more premium service and charge accordingly, your clients investment will often time get them results faster due to skin in the game. Do you think people take action when they purchase a $30 ebook? Often no. But if they spend money, they put a deeper urgency on themselves to succeed. I want you to flip the dialogue in your head. Instead of thinking how charging higher prices can benefit you, think of how it can, more importantly, benefit your client. By valuing your time, they in turn experience that, and oftentimes have more faith in your abilities to help them gain success. while getting maximum results and transforming your client’s lives. We recently did a survey to our audience and asked them what was the biggest struggle when bringing their business online. Many of them said they didn’t know how to attract high paying clients. And then they didn’t know just HOW to sell something to them. Well, it first takes knowing exactly who that audience is that you are trying to attract and doing research to find out if you want to attract them in the first place. Half of it is science and research, the other half is testing and refining. There are ways to start to determine if you are creating the right content to attract the right audience. 1. CALL OUT YOUR AUDIENCE. If you want to attract a person who is of a certain status or has a certain revenue they’re generating, let them know. Highlight those you have helped. Bring in case studies and even if you helped them for free, ask them to give you a testimonial on the transformation they achieved working with you. 2. TAKE ON FEWER CLIENTS. If you are just starting out, I have a little piece of advice. Stop trying to get thousands of customers and clients. Try to just get one client at a time. The pie in the sky notion of selling a course or something to thousands and not to say 100’s on autopilot sounds good, but often times it still takes a boat load of time to get it right. I would start with a coaching program if I were to start over. Fewer clients, higher prices, and scalable. a week where everyone in my program could come.This would leverage your time in the best way while still providing quality content. When I started out, that is how I was able to generate a consistent revenue online. took on fewer clients and sustained a good revenue. 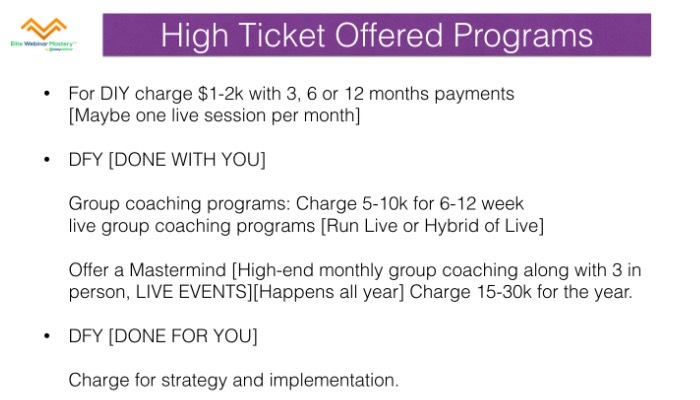 Sell high ticket group coaching from a webinar! In fact sell everything from a webinar. of courses even before they’ve just had 20-30 higher paying clients that were maybe a hybrid of one on one clients. I knew it wasn’t scalable, so that is why I started to build a hybrid of it. Where I could be a consultant but at the same time sell my course. Which leads me back to making an offer from a webinar. Let me break down the OFFER HIERARCHY based on whatever your program or offer is. What is the best pricing or offer for your membership sites? I know that is a big spread but hear me out. When I built my first course, I originally sold it for only 199 dollars and it was a big value based program. It was a YouTube marketing course. Selling it at that price revealed some holes. A good portion of those people didn’t consume the course at all. They basically bought and shelved it. This was the my very first experience with realizing that pricing is a qualifier. more hands on support and they were more apt to refund. I increased my pricing to 297 for the course and then guess what happened? My next experience was a fluke. I was hit up by a big name internet marketer who wanted to promote my course…but the only catch was that it had to be a 1k program. 3 additional bonuses that filled in gaps in my program. I changed the value proposition and targeting slightly. (Ie. I turned the program into ‘How to become a YouTube Marketing Expert/Consultant’ instead of just, how to leverage YouTube marketing. With a price increase, I sold just as many at $997 as I did at $297. What’s also amazing is that those who bought that level had greater results and fewer refunds. So now, I focus on at a minimum for a training course (Full course) at least 1k. For a 1-2k offer. Consider a 3 , 6 or 12 month payment schedule. 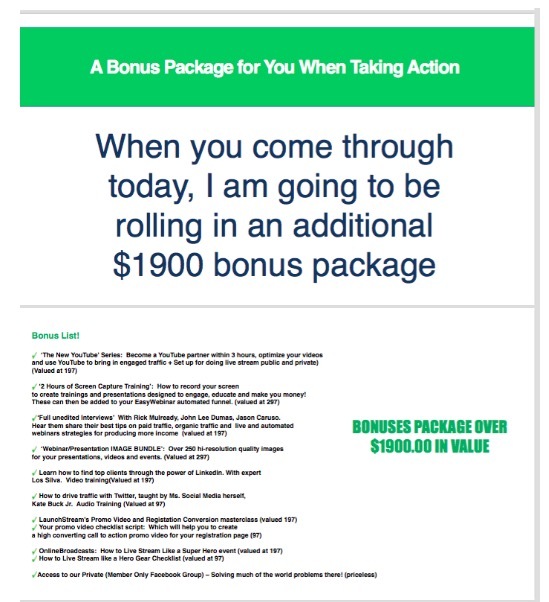 Also consider bonuses based on full price as well as super quality webinar only bonuses. In it I talk about what to do when you get to the Call to Action part of your webinar. (ie, where you make your offer) Here is just one of my slides below that discusses it. Something you should know. First when getting to a pitch and offer point. Mention the benefits of the benefit first and people who are experiencing results from that benefit. Plus the results someone can achieve from it. This will help to start to bridge into WHAT the investment is. The investment needs its own crafting and justifications. Such as how long after someone comes into your program will they potentially earn their investment back. 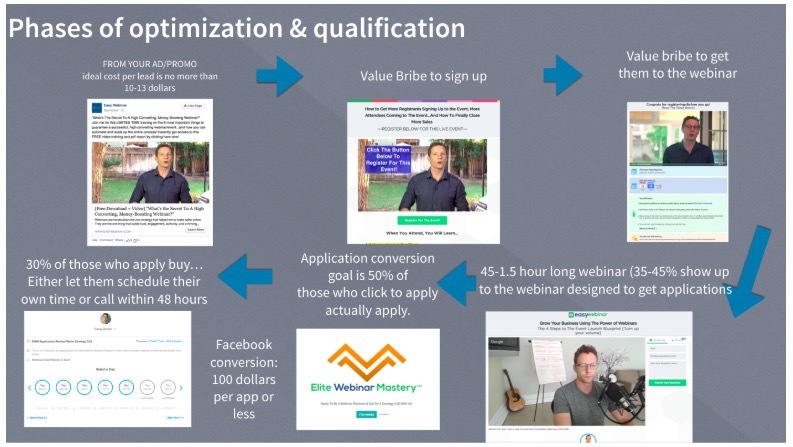 You need a high ticket webinar funnel. Something that I have coined with my webinar expert friend Jon Schumacher…An evergreen profit center. Below is what it looks like. The basics of a high ticket funnel is that much of the funnel is based around qualifying the type of audience that is going to receiving your offer. And in this high ticket funnel, the more your message is inline with the audience, the better you will do once you get these people on the phone. The offer on a high ticket funnel should take someone to an application or strategy call. Preferably both. Whether you first take people to an application first or not, it is very important to have it for your own benefit so that you know if someone is worth your time on the phone converting them to a client. The key to a high ticket offer is… LESS IS MORE…. In fact the more intimate and more concise and simple the process the better. People simply want clarity. They want to know the secrets without all of the fluff. So often times, doing less than more is key. While at the same time doing it in an ENGAGED way that promotes excited education and lightening fast implementation. High ticket should be HIGH TOUCH, ENGAGED, LEVELED UP METHODS FOR EDUCATION and a REQUIRED COMMITMENT AND ACCOUNTABILITY. And as we use webinars to acquire clients, we also use webinars as a backbone to our TRIBEMINDED system which provides this high touch, leveled up training + accountability. The ultimate benefit of it is that this method also give TIME back to you. As such, if you combine the TribeMinded method for your coaching offer (Which is basically how you fulfill your program), you will close more clients into coaching clients. This unique system allows you to ALWAYS BE CLOSING people into your program which creates a learning track specific to them. The problem: Most coaching programs open doors and have to close every so often. Those times when you close your doors for say your 8 week coaching program can mean NO MONEY/REVENUE coming into your business. The SOLUTION: Our method allows you to both acquire and close people into EVERGREEN high touch programs that work without you being there but still have that high touch experience. In fact, your total time commitment per week can be as little as 1 hour a week. This also means there is no ceiling for how many people can be added to your program. The TribeMinded EVERGREEN COACHING program gives you the ability to create a bigger leveraged impact that brings in more coaching clients more often. If you want to learn more about our automated booking and fulfillment program designed for coaches/consultants and those in the service industry looking to turn their service into more of a coaching to leverage their time and roll in more clients you can join our streaming workshop all about it. If you want happy clients, who succeed faster, who are way less of a headache, follow the steps above. And when creating your offer, follow the above steps. Comment and let us know what questions you have about what you offer. And of course…for more on this, join my streaming workshop on this topic. Think of the best storytellers you’ve read, heard, and watched online. What was it that made you connect with them? Was it seeing their success on Instagram or Youtube by showing off expensive cars and lavish homes? Or, was it hearing or reading about how much they struggled at the beginning. About how they worked at a dead end job and finally quit to pursue their dreams. Or how they nearly failed at their business but found a way to persevere. You always remember these individuals backstories more than any new toy or vacation they post online. These are extremely memorable and make it easy for you to relate to them. I call this the broken glass moment. Here’s what I mean. When you see a normal window pane of glass in a car you probably don’t think anything of it. But when you see broken glass on the side of the car window, you might get concerned and want to know more. Did someone break in? Was there an accident? Is everything okay? Notice the difference? The broken glass tells a much different story than a normal window we all see every day. In the sea of social media, personal brands, and endless messaging online, it’s hard to know who you can trust anymore. Consumers seem to be able to detect someone who is out to make money versus someone who is genuinely trying to make a difference in the lives of others. Transparency shows your audience that you’re trustworthy. The more vulnerable the better. If you’re being really vulnerable and sharing a deep dark secret they will really trust you. Sharing your flaws with anyone is challenging. It requires you to admit that you failed, made a mistake or had to overcome a difficult situation. Maybe you even created the dilemma yourself but have to figure it out. Audiences want this kind of content because they aren’t perfect and want to relate to someone else who isn’t’ either. Sharing this kind of vulnerable content makes you 100X more relatable. It shows that no matter how successful you are, you’re a normal person with flaws, just like them! The easiest way to be transparent is to turn on your camera or start writing when you’re feeling vulnerable. Document the process instead of always creating is much easier. This can take a huge amount of pressure off of feeling like you have to create all the time. Documenting your journey has never been easier as you always have your phone close by. Simply turn it on and let your audience know what is happening in your life. Document the goods, the bads, and what you can learn from it like I did with the broken glass video. Not only will this make you relatable, it will help you learn from your own mistakes when you look back on them. Personally, I’d much rather follow someone online who shares both sides of the story instead of a one-sided success story. If you’re creating content for the right reasons, you want to be as honest as possible with your tribe. Plus, sharing your failures and setbacks will only help them succeed faster by not making the same mistakes you did. As they begin to relate with your message the bond between you is exponentially greater. Once you begin to roll out coaching or online courses, this makes selling nearly effortless as you’ve already done the hard part first. You Have to Build Trust Before Selling? The internet isn’t like it was five or ten years ago. People have more options than ever, which means that they are more selective before buying products. People tend to buy from people they like, not another internet marketer promising the world. It’s why you don’t try to sell a $5000 mastermind or online course to a cold lead. You have to build trust and credibility with your audience before asking for that kind of investment. The same goes for your first video, ebook, webinar or course. You want to be incredibly memorable on your first interaction. If you’re not sharing your broken glass moments you’re missing out on a huge opportunity to build an insane amount of trust with your audience. Yes, it will be scary at times. It’s not easy to share some of your most vulnerable moments in life and business with the world. But it will be worth it if you can get the courage to just start. Start by documenting instead of sitting around waiting to create a masterpiece. You can’t build an epic business or personal brand by hiding in the shadows. People want to relate to you and learn from you. Once they do, they’ll be part of your tribe for a long time. Are you ready to share your broken glass moments with your audience? Grab your FREE Your Story Template by clicking the button below. This will help you promote yourself through social media and position yourself more effectively on your next webinar! a high-end client that works like gangbusters. month wanted to push to the 500k a month. We had a call and from the call, we figured out a game plan to improve their show up rate to their webinars, and moreover a way to keep their peeps on the webinar till the end. The interesting thing is that this isn’t always cut and dry. your audience truly can benefit from. they are doing high ticket sales calls from their workshop. And so these 3 particular strategies are for running funnels where automatically book up your calendar with super targeted & highly qualified leads. Again, as a reminder. This client does really well already. So basically, we were looking to do tweaks that would create much bigger results. So what were some things that could be improved? Their workshop was too long. It was about 1.5 hours long. For a webinar that doesn’t sell directly from the workshop, it should be condensed down to about 30-45 min with a CTA of a strategy call. This client was losing attendance during the webinar. at the beginning of the webinar to keep the attendees committed till the end. and expectation of what they’ll walk away with from the webinar. Solving their Hell and moving them to their Heaven. 2. 2nd biggest pain solved. Step 1: Write these down. Step 2: Now list out these 3 things. but an audit of the exercise they just spent time doing. This, of course, makes the strategy call more personalized and sets an early expectation as to why they should stay to the end. It also helps to convert more of these serious peeps into becoming clients. someone had from their process. 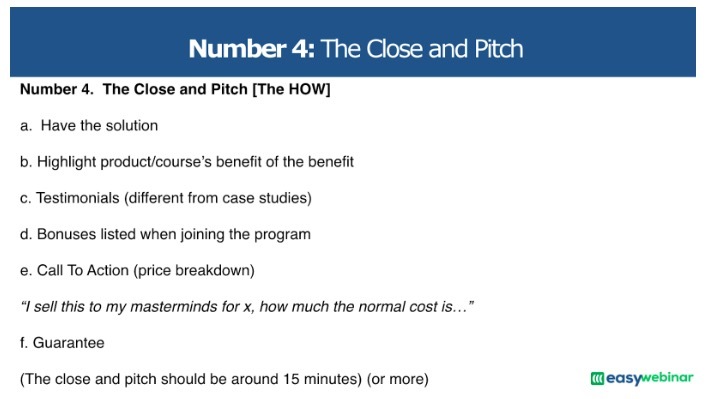 You see, what most people do is wait until the very end of the webinar to highlight case studies or results. When in fact, the name of the game is to entice your audience early…and tell them WHY they need to stick around. a few as it relates to a webinar funnel. What are the other Conversion Points? I have a short but impacting workshop you can watch that goes into detail. me and let me know what you thought about the workshop! This is a very special announcement. For the last several months we have been working on a brand new platform that changes the way you engage with your audience. It brings in a brand new technology engine for EasyWebinar which includes HD Video and Surround Sound Audio. In fact, it seems the more presenters you add, the better the quality gets! 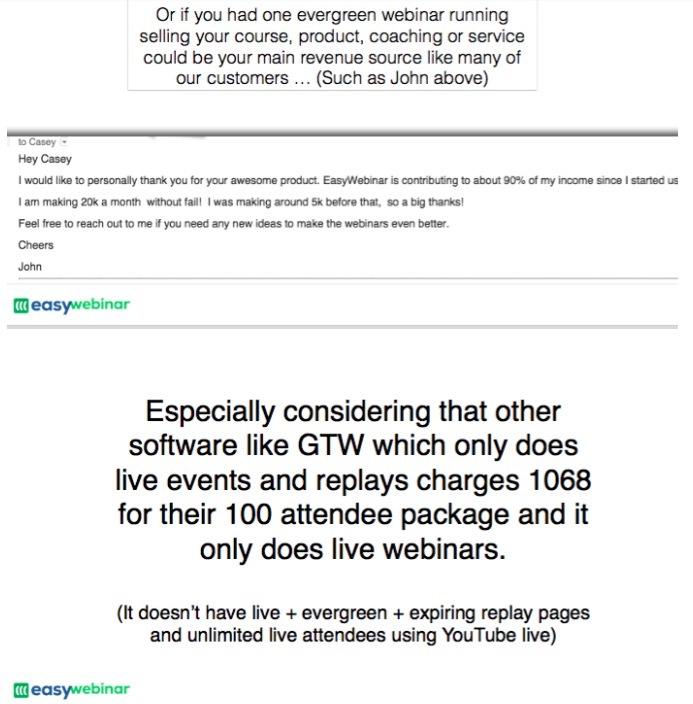 If you don’t know, EasyWebinar is a software that does both live and automated webinars and we have been serving audiences for some time. With over 7k customers we have been on a constant mission to continue to up the game in the world of automation and engagement to essentially help customers create a deeper relationship with their audience, build their leads and make more sales from both live and automated webinar funnels. Last year we decided to go all in the LIVE side of our platform. At that time we created a deeper integration with YouTube live to where you could use the front end of EasyWebinar with YouTube live as the video stream. We were able to lessen the latency gap from 20 seconds to 10 seconds using YT live & protect our audience from the impending Google Hangout shut down by not going down the Google Hangout app rabbit hole like many of our competitors did who are now in hot water because of it. Plus, we were able to provide a reliable solution for those who needed stability and growth in the live space for events ranging from 50 attendees to 20k+ attendees. Last year was also where we started to flesh out building out our own LIVE STREAM ENGINE. We knew that we always wanted to have our own proprietary live stream system. A system that didn’t rely on any other outside platform to function in a top performing way. A system and technology that would redefine engagement…and truly compete with Zoom & GTW. A platform that would allow several broadcasters in the room, a way to share anyone’s screen in a super crisp way, make attendees presenters, all in HD and without any delays. to announce that this new Live Engine is on it’s way out! Have up to 4 people in a live room. Share your camera and audio source perfectly in HD and 3D Surround Sound. Share your screen or any other presenters screen. As Admin bring in attendees and make them speakers. Record all session and turn them into evergreen webinars or replay. Deliver offers and chat in real time with all attendees. If you are an existing customer of EasyWebinar, it is soon to be released to you as long as you are a yearly recurring paid customer in good standing or a legacy customer from our 4.0 or 5.0 version. You see, Instead of forcing existing customers to have to upgrade to use our Live Stream Engine, we want to give it to them/you for free. In the future, our EW Standard/Basic package will be more than what our existing customers are getting now! What comes with this Basic Package? You will be able to have up to 100 attendees in the room live. Why are we putting a limit on the attendees with this new platform? Simply put, it is higher quality. Plus it is hosted by our own platform and has HD and No-Latency capabilities that YouTube Live doesn’t have. you get to still have the unlimited attendee webinars that can run through YouTube live! This is huge because no other platform offers this option and their own live stream tech. But also…we will be opening upgrade options to get attendee limits pushed to 500 and 1000 persons per webinar for our LIVE Engine. Which of course has the benefit of no-latency streaming, HD video, Surround Sound Audio and HD Screen-Sharing. Our pricing will be changing soon to reflect this new Live Stream Engine…and we might be phasing out YouTube as well…so basically now is the time to come in! 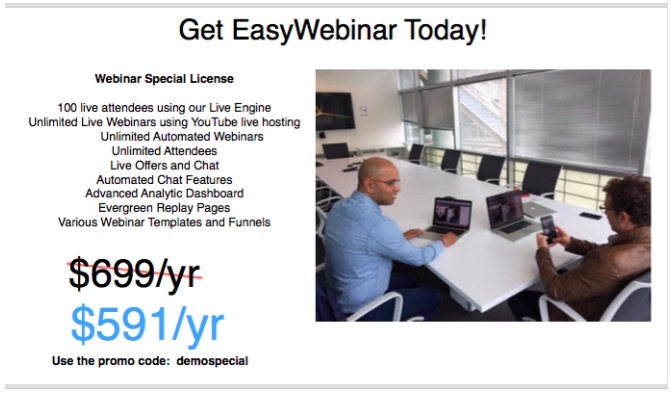 You’ll have the benefit of getting access to EasyWebinar at the lowest price possible as we continue to be the leader in Automation and now Engagement! Our big vision for you is to leverage our tools & training to harness the power of true engagement with your audience while scaling up your business using our advanced automation strategies and technology. That is why EasyWebinar was created and that is exactly what you are going to be getting with us. We are on a mission to help you to engage more, build and grow your business, create wealth & happiness along with discovering more free time in your life due to our automation systems. We believe in heart centered scalability in life/business and that is our mission for you! To check out how the new system will work, watch this early demo video above. 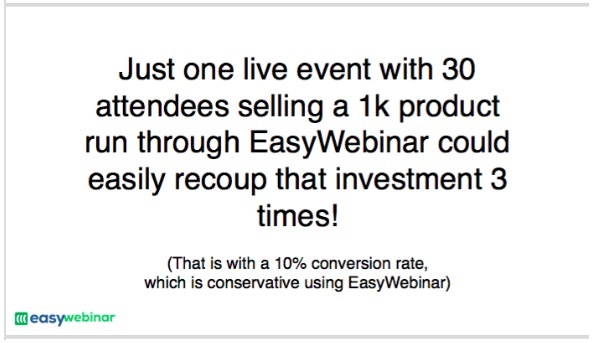 And then come into EasyWebinar at the lowest price possible RIGHT NOW! Go to : http://easywebinar.com to learn more. My life = Burping, Feeding and Poopy-ness. A quick recap. We had a baby girl 3 weeks ago. My wife gave birth while I was in Haiti visiting the 2 boys we are adopting…so these last few weeks have been a whirl-win. They have also been some of the most challenging moments I’ve ever faced. For all you parents out there, you’re all my personal heroes. Raising a baby (or any child) has to be one of the most difficult yet rewarding things out there…(you have the job of raising a good human). ‘Am I going to screw this up?’ comes reeling in. Especially when we still love work and what we do. just as important to me as my personal goals. they get your enough of your attention? I’ve been in search of this ‘balance’. However, what they don’t tell you is that you can never achieve it. It’s like having a mantra that you write on your vision board above your desk. It is something you strive to achieve but never fully attain. If you attained it, what would you do then? You’d just have a newly revised mantra. So instead of trying to find the balance in it…the mixture becomes 1 part ‘letting go’, 1 part ‘prioritizing moment for both and keeping a schedule’ and 1 part of ‘allowing things to be flexible and not beating myself up if I have to zig zag.’ Such is life. change based on your own circumstances! So what is the constant? Well even when the tides change, your internal core, heart and soul shouldn’t. Like the strong structure of a ship, the boat might take on water or have to change course, but ultimately the strength of it’s bones is what keeps it afloat. Having a baby has been an interesting test of when I work and how to prioritize my schedule…because let’s face it, my schedule is based around our new baby. Even with a nanny coming soon. So I’ve been having to adapt to how my time is spent. Decisions I’m finding are now more resolute. Plus I am focusing on the things I should do (high leverage actions) and allowing my team to do the rest. 20% of our actions can account for 80% of our income…so think about how that can play a factor in your day to day. on in your business that will reap the biggest results? For me…Webinars have been great. They have been the one thing that frees up more of my time and allows me to leverage automation and engagement to essentially teach more and sell more. (This is a 20% action) You can learn more about my first few terrible webinars that still ended up making me money and the journey/mistakes and ah-ha’s that I had online by clicking here. Relationship building with prospective partners who I believe in. Getting behind certain programs that I have gone through which have helped me in my business is one of the easiest ways I can provide you value. I can’t teach everything, that’s why I find passionate, heart-driven and result based experts to help my audience achieve more in their day-to-day. Being transparent. Although I have dropped the ball on delivering as much content as I had hoped to create since the baby came, I still feel that transparency and sharing your moments of both success and failure is a powerful element to building a know, like and trust. Especially as a personal brand. Having a team that can be the engine to your business even while you’re inundated with other things. My team keeps us afloat. And we are always re-investing back into the business. That’s another powerful element. If you’re stingy about investing in your business, it will stay stagnant. That’s why I have made a new partnership this year which will allow me to execute more while working less. As a recovering perfectionist, it is hard to give up that control. But after a while you realize that sometimes you’re the bottleneck to your own success. Want to learn about 4 productivity hacks? CLICK HERE. I have a mission. A mission to create more impact in the world with less work. And to empower you to do the same. Therefore, my first goal is to get you results. And nothing I’ve created or accomplished has churned out more results than my webinar program and software. If you’ve been wanting to finally learn how to simplify and dominate your work/life balance, deepen a know, like and trust with your audience and sell your products with consistency daily or weekly, then join me for this workshop! blocking you from having success with them. (Once you register, I have an instant free gift for you. Please note: At this event, I am going to reveal an opportunity that I haven’t had available for some time. You’ll be able to get the keys to a program that has helped hundreds of people, including Jodie Nevid who made 19k from her 2nd live webinar by implementing the strategies I teach. and Implement This 1 Funnel That Will SkyRocket Your Biz! 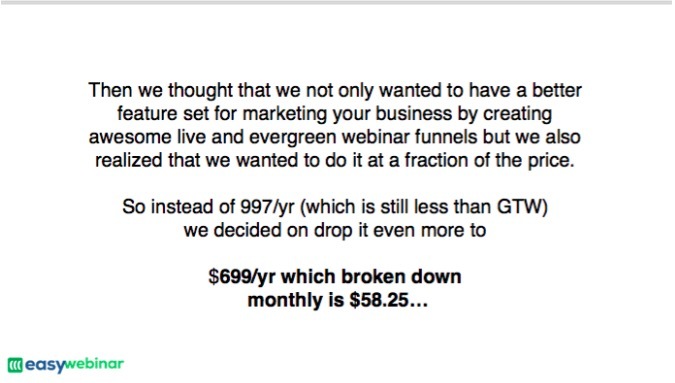 How you can kill it running Automated Webinars using EasyWebinar and a 27k a month case study from this one dead simple funnel…and how some of our clients/customers are making 20k a day from just a few tweaks on this same funnel. But most importantly…walk away with the secret to the most powerful funnel for 2017. Sound interested? This post is essentially the the road that I’ve traveled from 15k a year to a million dollar business. 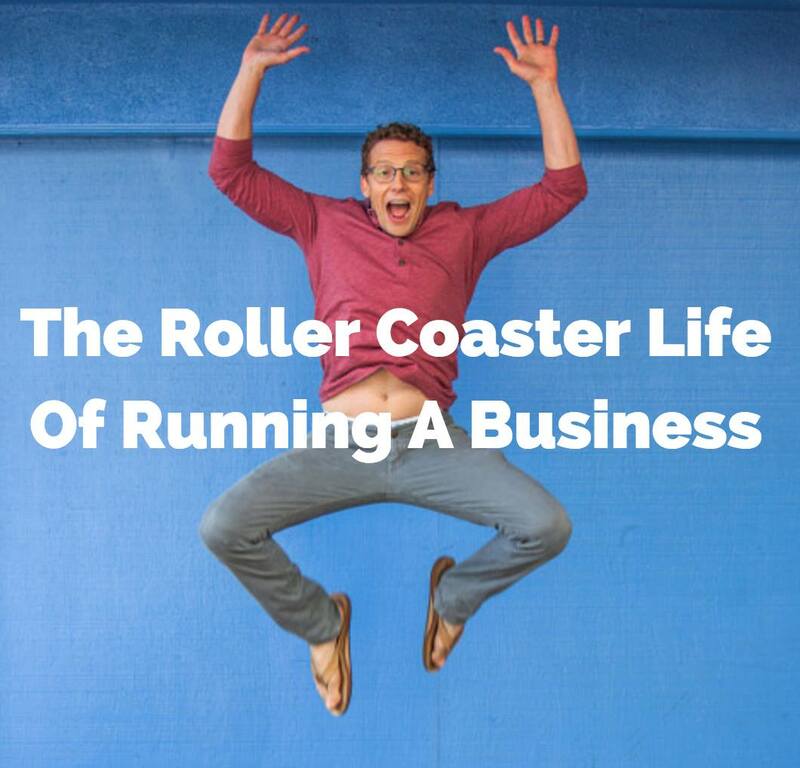 In it I share the realities of what it takes to run an online business and the one assertion and the one strategy that got me where I am today. Putting all the pieces together for running a successful business can be daunting. When you think of all things you need to have let alone learn, it can cause you to never take action in the first place. When I first started creating my online business I knew nothing. Nothing about email marketing, copy writing, blogs, WordPress, software automation, CRM applications, video content creation, social media… nothing! I knew how to check my email and browse the web. Looking back I’m even amazed I made it this far. I remember working out of the spare bedroom in my house with this idea of building leads online using YouTube where at the time I was making absolutely nothing after the recession hit with only a few thousand in the bank. We were also on the brink of foreclosure. We went months behind on our mortgage. At the time, I was thinking, I am just going to give up. Give up pursuing this weird business that no one really understood. I would have the occasional fight with my wife who was supporting us as well as she could asking… ‘Babe, are you going to start seeing some results?’ I thought to myself… ‘I don’t know honey… I am really worried that I won’t be able to have any results.’ … but I never spoke it out loud. I thought about giving up on the house and letting it go into foreclosure and in fact giving up on living in LA in general and moving somewhere safer and easier. So what did I do? … 1 simple thing… I never gave up! Even though I was on the brink of quitting multiple times. When I couldn’t make money online or build leads as fast as I wanted to, I went out and hustled to get business as a video marketing consultant. I spend months learning about YouTube marketing and SEO. I applied that knowledge to helping other people with their content. I landed some clients on retainer. Nothing really big at the time, only 2 clients both starting at $2,000 a month. One of them was a small college and the other was a company that built leads online. These 2 clients were enough to hold me at the time. When I was about to lose my house, I decided to fight to get the loan modified. I had a hardship and so ashamed by it. Where now looking back, I would shake that Casey and say.. “There is no shame in failure”. I felt like I was truly sucking at life. Things would have been much worse if I had not had the support of my wife and family. In fact I made a promise to my wife that I would try to do everything I could to keep the house. That was the push I needed to keep fighting. I modified the loan on the house and after doubt a year of going back and forth with the bank to finally being able to afford to keep it. They dropped my payments down from $5,500 a month to $3,000 a month. While I was paving the way for creating an online business that I wanted. I had to start migrating my business from consulting to building online training products. I had a handful of clients (4-5), that I was still supporting while building my first course about YouTube. At the same time I was starting to do more content marketing on my blog. The nice thing about consulting is that it afforded me the time to create content to start building an audience. I knew that I needed to build leads, so I first created a 7 day video marketing bootcamp which taught 7 simple steps to getting more ranking with your videos. That was going to be the thing I used to build my email list because eventually I was going to start promoting my YouTube course to that list. All I did was made 5-10 minute screencast videos showing video ranking techniques. The videos didn’t cost me anything except what it cost to buy ScreenFlow for Mac ($99), and my time. When I finally launched the YouTube course I struggled to actually make sales! For the longest time, I couldn’t seem to make any sales directly to the sales page, or even from my 7 Day Video Marketing Bootcamp. And right around that same time I had started to hear about webinars but I knew little about them…I knew little about creating presentations…but I was ready to try! So that is when I started looking at webinars. (My inevitable evolution from video to live video) And of course that is when everything changed. I remember my very first webinar. It was a purely free, no pitch webinar. I just provided as much good information as I could. It was my first one. I remember I was so nervous. It was all about being an online marketing consultant. How I landed clients, how I created video proposals, how I priced my services. I was simply just sharing as much about the results and wins and loses that I had gone through being a consultant. I had about 65 people on live and I remember that I was just TERRIBLE. I was stumbling over my words, I used my wifi to run it and just felt like no one was listening. But by the end…I had a TON send out praises and gratitude for the information I shared. At that moment I knew that I sucked at webinars and that it was ok… because even when I was bad, I could still sell. Why? … Because I shared my KNOWLEDGE. People from all parts of the world just want the knowledge you have that they don’t. Even if you just started learning something. As long as you have had success at it or results than you can teach it and…people will pay for it. I started doing webinars all the time. Free webinars 100% of the time that gave free content away but also that offered access into my course. My first dollar online…came by way of selling my course from a webinar. My course was built using a membership platform called Wishlist…and my shopping cart was using Infusionsoft the CRM platform integrated into Authorize.net & PowerPay. (This integration made me want to pull my hair out!!) Luckily now shopping cart integration is so much easier with Stripe, Shopify and other platforms. My next struggle: What to price my products? I had to figure out at what to price my product. I went out and started doing market research to determine what the market would pay. Pricing is based on pretty much two things, what the market will pay and the value of the result. If you are a trainer and you can help someone get fit or get healthy what is that ultimately worth to the person you are helping? What if you are adding 10 more years to that person’s life? What is that worth? For instance some customers of mine make $20,000 a day using my webinar software. What does that tell you about what someone will pay? When I started I didn’t know any of this, nor did I have any customers. So what I did was I asked a few key people to go through the program and asked them what they valued it at. These were people that needed the information. This was really the only thing I could use to gage if this product was worth its merit. Plus the only customers I had were essentially clients that I had worked with. No one that went through the program, but companies that saw the result of my work…and that is what I used as testimonials and case studies. So I priced my YouTube course at $197 to start. From my first paid webinar, which believe me was also god-awful. I made sales! Albeit 2 sales, but I only had 40 people on live. My next webinar had 400 people on and it was in the back of my wife’s parents farmhouse in Iowa getting promoted by another big marketer. 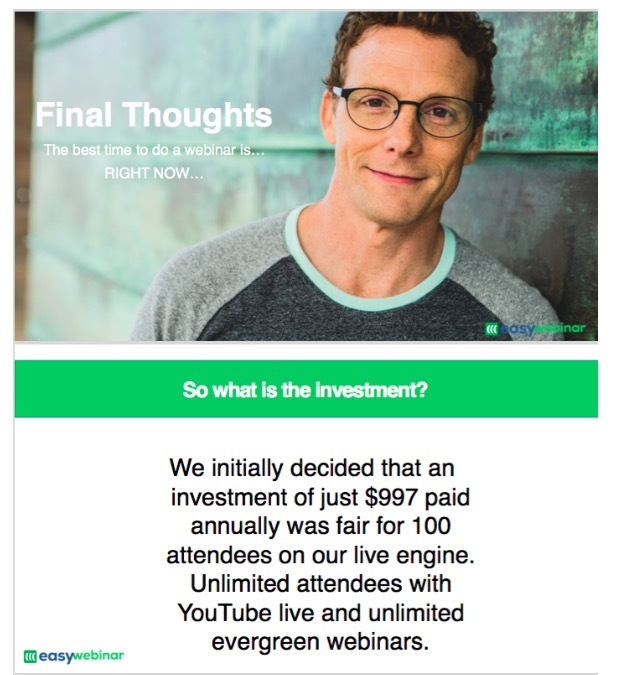 That webinar only sold 10 units. Which made money but not as much as it should have done. In fact one of the biggest suggestions that I received at that time was, raise your prices. So I did and didn’t change a thing in my webinar. What happened? My sales actually increased. Why? Value Proposition. Then another person requested to promote my webinar and product but only if the price was $997 or more. So what did I do? I increased my price to $1,000 added in a 15-minute consultation. 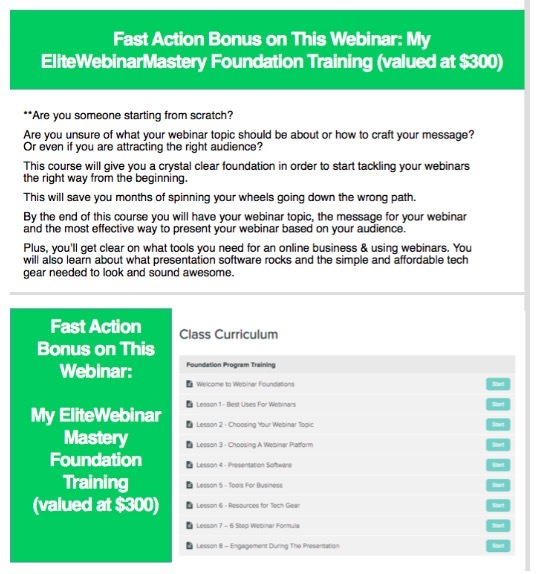 (Plus I added a few key bonuses to my webinar that were high value). This all happened in 2011. Remember price is based on 2 things. The results they receive from your product, course or service. During that time from 2011-2012, I built an email list to 14,000 and made $245,000 selling my online course. What did I do with the money I started making? I paid off my debt first. I started to fix up my house. I took my wife on a vacation. I paid my affiliates and jv partners. I finally took a breath…but when we are in it, we don’t stop to think we finally did it. We actually start to see how we can improve. Optimize our lifestyle and marketing. Continue to make mistakes and test, test, test. That is the name of the game when creating something of your own. Not being afraid to lose. To fight. Never in my life would I have thought I’d have a few different Saas companies that help thousands of people daily. But that is what I did also in 2012. While I was making money in webinars, I reinvested in software. I created a webinar platform called EasyWebinar and then years later started building other software all in the OnlineMarketing and video/live video space. I made my first million dollars in 2014. That was the year that I did my first major launch. And in 14 months I did $1.2 million dollars in online sales. And since then I have paid my second mortgage completely off on my house, started the adoption process for 2 kids in Haiti, and continue to drive my Prius. Each year I learn, I am tested, I succeed, I fail, I love fully and continue to strive for providing results for others and carving out the life that I want. I’m sure you and I are not that much different! As you can see, the one assertion was NOT QUITTING and the one strategy was WEBINARS. Would you like to leverage webinars in your own business? With our software and training we are always growing and evolving. Which brings me to our most recent evolution of our webinar platform and training program Elite Webinar Mastery. And I teach you all about how to implement webinars in your own business. Join Me For This No-Bull, Cut-The-Fat Webinar…and Implement This 1 Funnel That Will SkyRocket Your Business. How to take advantage of a killer opportunity that will give you clarity and all the tricks needed to dominate sales, list building and authority seeding with webinar.You’ll learn how you can copy our blueprints, strategy maps and funnels for creating a consistent marketing machine.But most importantly…walk away with the secrets to the most powerful sales funnels around. 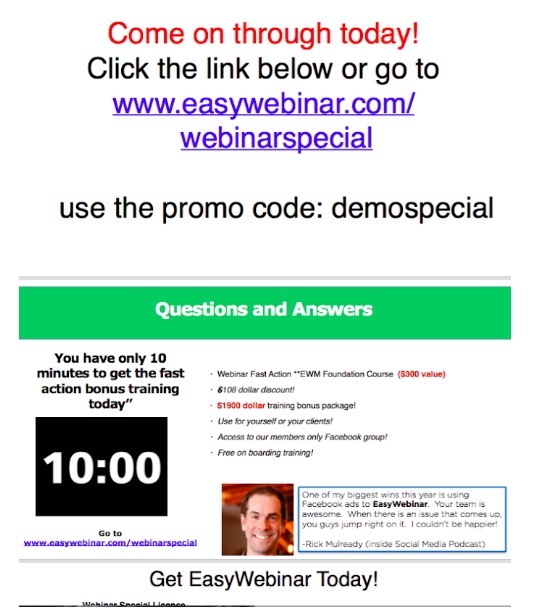 Want to learn how to dominate with webinars? Want to learn more about EasyWebinar? Unlike other platforms, EasyWebinar is an all in one webinar solution allowing for high engaged live events and advanced automation for more scalability in your business. The bottom line is EasyWebinar will let you breath easier as it also becomes the number one tool for profiting in your business. Just like it has helped thousands of our customers.